For those who managed to grab themselves T-Mobile's still high in demand HTC HD2, you'll be happy to find that a new ROM update is now available for the venerable smartphone. 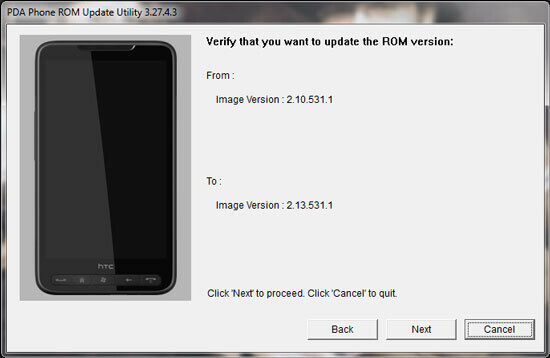 It brings the HTC HD2 from version 2.10.531.1 all the way to the most current version of 2.13.531.1, but it's not exactly known what new items accompany its release seeing that there is no change-log seen with it. However, that shouldn't stop you from downloading it and getting your handset up-to-date with everything. Assuming that there are still some fine tuning with the device, this version probably addresses some issues that probably have come to light since its release. I have a friend who put Android on this phone and loves it. Sorry, but a fully functional android port doesnt exist. How do i manage to backup all my programs installed on my device to storage card?? If the phone is set to factory default, does that mean I lose all my bookmarks, phone contacts, text msg, etc? Download PIMbackup. Free, saves contacts, messages, settings, etc.